CK Power provides standby power data center generators. In charge of maintaining critical load applications, data centers require a 24/7 backup power option. For businesses with sensitive components such as data centers and financial institutions, a loss of primary power can have devastating economic effects. Additionally, should a power failure occur, personal lives would be greatly affected. Requiring large amounts of backup power due to the size of their load, data centers are best served by creating a power redundancy using multiple generators to secure a constant uptime in power. Duplicating power generation for critical systems translates to reliability and an assurance of uptime. It’s important to create this redundancy in backup power generation. Given the essential information contained in a data center, having a single backup generator, while reliable, is still too great of a risk should a disaster occur. A redundancy of multiple data center generators to handle the load when primary power is knocked out is the most secure way to ensure essential power generation and mitigate risks associated with power loss. For backup power, we recommend Kohler’s line of generators. They have a wide kW range along with a greater response time and better fuel consumption. 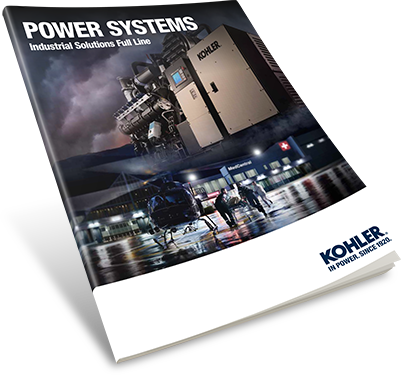 Kohler engines are ideally integrated into the whole power system. Kohler’s service network combined with their exceptional quality ensure uptime for the most demanding of applications. Lastly, the manufacturer’s product diversification means the ideal engine for the right application. When working with a generator distributor to provide data center generators, it’s important to determine if they can size the generator sets accordingly to your application. Additionally, can they give you different options and configurations regarding switch gear and more? Who you’re working with to provide a backup power system to the data center must be fully capable of handling the scope of the project and provide a large, diverse line of products suitable for a variety of needs. A generator distributor with access to a substantial service and parts network can make accurate, reliable recommendations for routine maintenance. Sticking to a routine generator service and maintenance plan is a prominent factor in ensuring guaranteed power generation during unusual or challenging incidents. CK Power has a team of experts ready to answer your questions about data center generators and begin making recommendations for your application. Be sure to contact us to learn more and begin the conversation to find ideal solutions for your business.